Available in white or clear. Protects the wood surface beneath from both scratches AND impact! Easily installed with included peel-and-stick Low Profile Dual Lock Coins by 3M. No tools required for installation. Get set-up in under a minute! NOTE: Maximum depth is 5 1/4" and maximum width is 35 1/2"
Could you use a stock size instead? View our standard sizes. Custom sized windowsill protectors, available in clear or white. 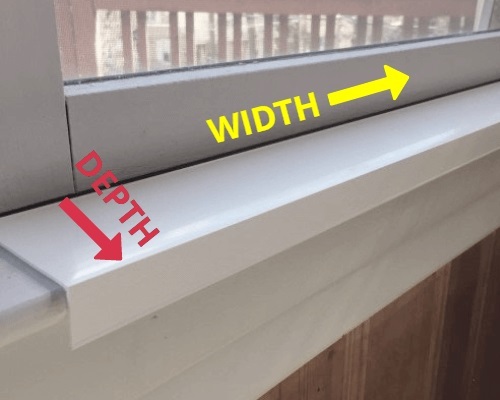 Choose your custom Sill Shield™ width (left to right along the length of the windowsill) and depth (front edge of the sill toward your window). All of my Sill Shields have a 1” drop in the front to wrap around the corner of the sill. You can order online, or by phone at 845-477-0737. After years of constantly repainting my sills, they finally got to the point where the wood was so damaged, they had to be replaced. I wasn’t able to find a product to protect the new ones, so I created the first Sill Shield™. My sills are white, so I chose a white outdoor grade U.V. material to resist yellowing. For the clear Sill Shields, I chose a material called PETG, a tough, clear material best known for making blister packs and water bottles.. The quality and durability of my original Sill Shield™ is superior to any alternative, and that’s why I’m the only one that offers my exclusive lifetime guarantee: As long as I’m alive, they’re guaranteed - when I’m gone, you’re on your own. If you need special customization, such as a notch for a crank, email me at [email protected] and please send a picture if possible. 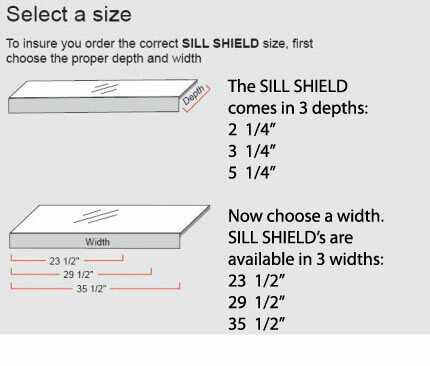 Ordered the sill shield in the dimensions that I needed to fit my deep sunroom window. It fit perfectly and arrived quickly. The shield has been protecting my sill from my dog’s nails from the moment of super east installation. A must have!!!!! The sill shield was perfect for shielding my window sills from my dog’s claws when he jumps up look out the windows. Product was easy to order, shipped quickly, and was very easy to install. The protector is made to order and of good quality. We had our kitchen cabinets newly painted along with the trim around the window above the kitchen sink. The window sill is low enough that it occasionally gets water splashed up on it when using the faucet. We wanted to protect the sill from water damage, so we ordered a custom width and depth shield. It arrived promptly, we installed it immediately, and it is doing its job - shielding the sill from moisture. 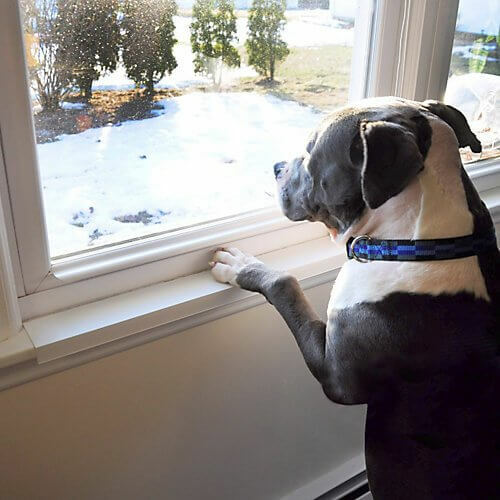 This is a brilliant product and it is perfect to protect the sill of our sliding glass door from our dog. My only wish is that they could be longer, so we ordered two for the full door. Very easy install and good look, and shipped super fast! 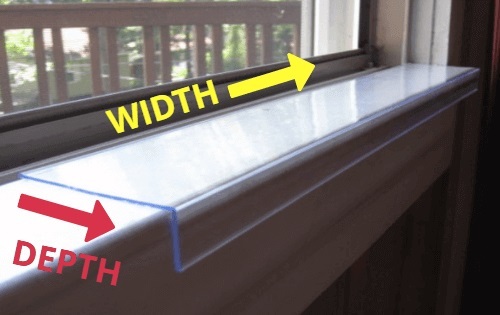 I only wish I'd known about these sill shields BEFORE my dog damaged my sills. 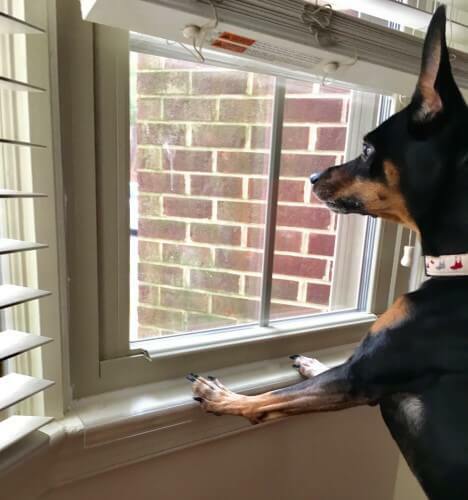 (Nothing a little sanding and painting won't fix) Sill Shields are perfect - my dog can still put front paws on sills and look out the window - and with the shields in place she will no longer scratch the sills. They fit perfectly and stay in place. Ordering is straight-forward and easy. I highly recommend this product.